If you're looking for original newborn Halloween costumes this year, do NOT head over to your standard costume store. Yes, that was do not head over to the giant blow-up pumpkin down the street that magically appears every September and carries rack after rack of the same costumes your neighbors are buying. Unless, I guess, you actually want to buy what everyone else is buying. But I'm guessing that's not you. Mainly because you're still reading. 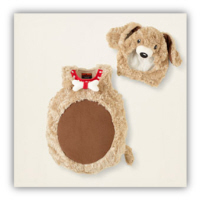 There's a stunning variety of cute baby costumes on the virtual back shelf of one of your favorite clothing stores. That's CLOTHING. Not costume. To see all the "tells" on these costumes, click on the photo and receive all the details your little heart desires. This particular store runs a lot of sales and coupon codes. I've listed them below. Have fun saving money AND being the most original trick-or-treating family on the block! 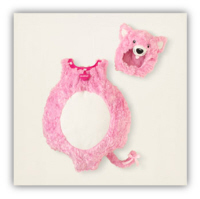 This cuddly costume has faux fur and glacier fleece to keep your baby's core warm. It has two pieces, the body (with tail) and the separate headpiece. Keep her legs warm with matching tights and twinkle her toes with these silver Mary Janes. 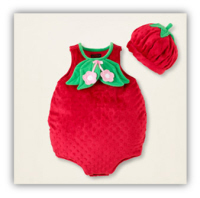 This is a charming little ensemble for your tiny charmer. Pull out a pair of brown knit pants or pick out matching pants online. Then use brown mittens and shoes. These adorable brown seude pugs make the most absolutely perfect paws. Grandma and Grandpa will flip! If they made this in adult size, I could be tempted to wear it. It has silky soft fleece fabric (the kind I wish they made sheets of) designed with tiny bumps (for seeds) and lined in jersey knit. The costume, with the beret-styled hat, is adorable on it's own or with these green-and-white striped tights, that you can find only online. I laughed out loud at this one, it's such a cute baby costume. It uses the same great fleece and a similar beret style hat to the strawberry. Snaps on the bottom of the costume make diaper changes wrestle-free. 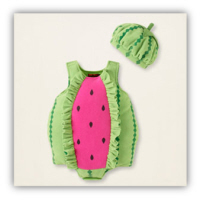 You can purchase just the costume (click on the photo), but I really think it moves up a notch when you add the green/pink striped tights and the pink suede boots that look just like mini-pugs. 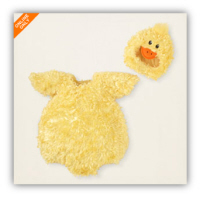 The ultimate cuddly little baby chick costume! He'll look so cute waddling from house to house in this! Unless you're in the warm South for Halloween, you'll need to keep those chubby legs toasty with some sweatpants. This yellow pair matches perfectly. A light brown set of sailor shoes are a practical way to create the illusion of webbed feet, while gaining a sturdy pair of sneakers he can wear all winter. This little buggy is available only on the online store. It fits newborns as young as a few weeks all the way up to 24 months. Slide on some red and black striped nylon tights and finish it off with these black gorgeous lil' hearts mary jane dress shoes. The key to true originality is scarcity. You want a really original costume design for your newborn? Dress her head to toe in diamonds. I guarantee no one else is doing that. That's original. Or, you can find newborn Halloween costumes at the places no one else thinks to look. I guess it's up to you. But don't come crying to me when your kid ends up being mobbed for diamonds! If you choose to buy the costumes above, The Company Who Offers Them (I'm being so sneaky!) will give me a few quarters and dimes at the end of the month as a "thanks for the referral". Obviously this comes off their bottom line and is not added on to the price of the costume. If you want to see their entire Halloween section, with it's neat flashy graphics and costume ideas for older kids, click here. 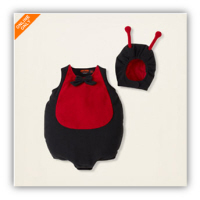 ♥ Flitterific Baby Fairy Costumes: Which Matches Your Pixie Best?